Place walnuts in sugar in a small skillet over medium heat stirring constantly and cook for 3-5 minutes or until sugar dissolves and turns a caramel color. Pour mixture onto aluminum foil in a single layer and let cool. 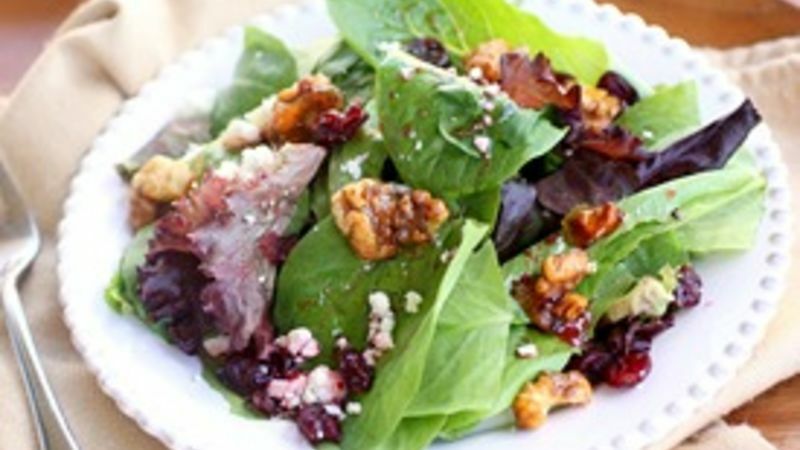 While walnuts are cooling, place mixed greens, Gorgonzola, dried cranberries, raspberry vinaigrette, vinegar, and olive oil in a large bowl and toss. Break cooled candied walnuts into pieces and add to salad. Toss again to incorporate and serve. Salads should be simple, fresh, and full of flavor and variety. Love ya, Mom, but we literally ate the same salad made with sliced green peppers and tomatoes on top of romaine lettuce every single night of my life growing up. Somewhere along the line, I developed a salad phobia so severe that if I was getting together with friends and was asked to bring something, I would always say, “I’ll bring anything BUT the salad!” I guess I always avoided salads because I didn’t have very many in my repertoire and because I was excited to check out the salad that someone else brought in hopes of finding a new gem of a salad with which I would fall in love. No longer! 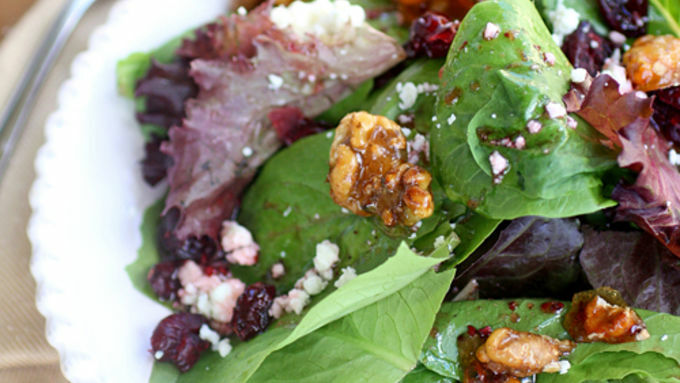 This Candied Walnut and Gorgonzola Salad is elegant and impressive without a lot of work. The sweet and crunchy candied walnuts pair perfectly with the creamy and salty Gorgonzola cheese. The raspberry vinaigrette adds some color and sweet flavor to the dish. Candied walnuts just take a couple of minutes to make and add a fancy element to this salad that will have people thinking you’re a gourmet cook. Just cook some walnuts with some sugar over medium heat for a couple of minutes until the sugar turns into this beautiful caramel color. Next, pour the coated walnuts onto some aluminum foil to cool. Done! Now, this is my go-to salad for dinner for my family or dinner with friends!